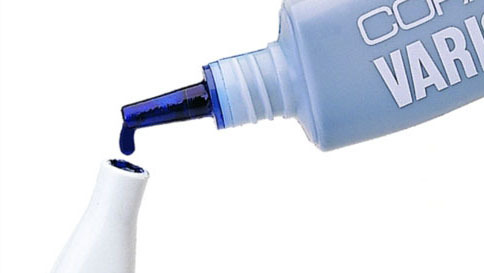 COPIC markers are refillable using this fast-drying, permanent, non-toxic ink. COPIC ink is alcohol-based, does not dissolve toner and works well with watercolors and colored pencils. Just match the color number on the marker with the corresponding ink color number. Markers can be refilled with the handy refill booster attachment or by dabbing the ink directly onto the nib. The 25cc ink bottle has enough ink to refill any of the COPIC markers many times. In addition to refilling Copic Markers, the various ink bottles can also greatly expand the colour range for artist's working with alcohol ink right out of the bottle on a variety of surfaces from tile to Yupo paper. With over 300 colours to choose from. ALL Various Ink available in 25cc bottles. 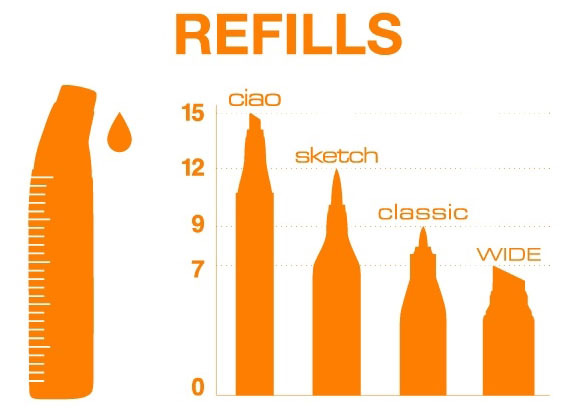 Each Various Ink refills your Copic Marker 7-15 times, depending on the style. The Copic Sketch can be refilled up to 12 times! This equates to just over $1.00 per fill, greatly reducing the cost of the marker over its lifespan. Never use a disposable marker again!